Posted By:Unknown | At:11:40 AM Be the first to comment! 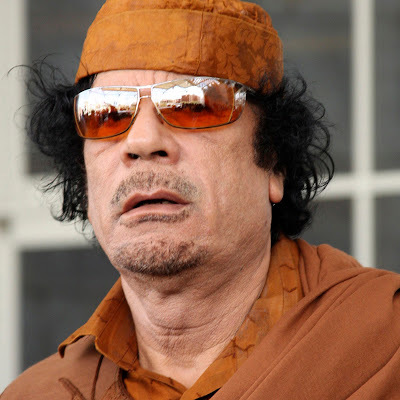 TRIPOLI, Libya (AP) – Mounting calls for an investigation into whether Moammar Gadhafi was executed in custody overshadowed plans by Libya's new rulers Sunday to declare liberation and a formal end to the eight-month civil war that toppled the longtime dictator. An autopsy confirmed that Gadhafi died from a gunshot to the head, Libya's chief pathologist, Dr. Othman al-Zintani, said hours before the liberation declaration was to start the clock on a transition to democracy. However, the pathologist said he would not disclose further details or elaborate on Gadhafi's final moments, saying he would first deliver a full report to the attorney general. Libya's acting prime minister said he would not oppose an investigation, but cited an official reporting saying a wounded Gadhafi was killed in cross-fire following his capture. The Libyan revolutionaries' image had been "a little bit stained" by Gadhafi's death, Hammond said Sunday, adding that the new government "will want to get to the bottom of it in a way that rebuilds and cleanses that reputation." "It's certainly not the way we do things," Hammond told BBC television. "We would have liked to see Col. Gadhafi going on trial to answer for his misdeeds." Clinton told NBC's Meet the Press that she backs a proposal that the United Nations investigate Gadhafi's death and that Libya's National Transitional Council look into the circumstances, too. The 69-year-old Gadhafi was captured wounded, but alive Thursday in his hometown of Sirte, the last city to fall to revolutionary forces. Bloody images of Gadhafi being taunted and beaten by his captors have raised questions about whether he was killed in crossfire as suggested by government officials or deliberately executed. Gadhafi's body has been on public display in a commercial freezer in a shopping center in the port city of Misrata, which suffered from a bloody siege by regime forces that instilled a virulent hatred for the dictator in Misrata's residents. People have lined up for days to view the body, which was laid out on a mattress on the freezer floor. The bodies of Gadhafi's son Muatassim and his ex-defense minister Abu Bakr Younis also were put on display, and people wearing surgical masks have filed past, snapping photos of the bodies.